Internal medicine is a specified field of medicine that deals specifically with the assessment, diagnosis, treatment, and prevention of adult diseases. Doctors who work in this field are called internists. Internists are trained in the prevention, diagnosis, and treatment of diseases that afflict adults, and typically handle more acute conditions than other primary care physicians. An internist's ultimate goal is to prevent, treat, and heal a patient's ailments and illnesses. Internists are trained to solve puzzling diagnostic problems and handle severe chronic illnesses and situations where several different illnesses may strike at the same time. They also bring to patients an understanding of preventive medicine, men's and women's health, substance abuse, mental health, as well as effective treatment of common problems of the eyes, ears, skin, nervous system and reproductive organs—caring for the whole patient. White-Wilson internal medicine doctors serve as a patient's primary care physician, and work with you on your overall health—from routine annual physicals and preventive medicine to managing and treating chronic diseases. White-Wilson internal medicine physicians practice at the Fort Walton Beach, Destin and Navarre Clinic locations. Adult health problems can be complex to diagnose and treat since many adult patients suffer from severe, long-term health problems and /or multiple conditions. To better address patient needs, internists are notorious for consulting one another and over the course of time, this practice has earned internists the moniker the "doctor's doctor." 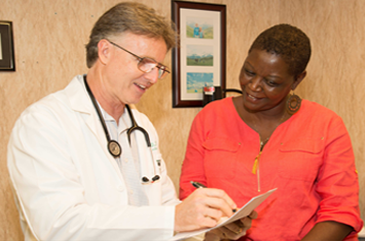 In addition to consulting with other internal medicine doctors, White-Wilson internists work closely with White-Wilson specialists to diagnose and treat complex conditions, providing patients a more comprehensive approach to their care. Since White-Wilson Medical Center is a multi-specialty physician group, all of our health care providers, (including primary care, immediate care and specialty care providers) have access to your White-Wilson electronic health record. This helps to ensure your entire health care team has access to the same comprehensive, up-to-date information. For example, your White-Wilson internal medicine doctor can see what tests your White-Wilson pulmonologist ran and their results. When to See an Internist? Needless to say, internists also work with adults who are unwell. Many adults, particularly older adult patients who suffer severe chronic health problems, choose to see an internist as their general practitioner. Our Internal Medicine team is your partner in care and provides comprehensive annual wellness exams for Medicare patients. Learn more about the importance of Annual Wellness Exams here. When you need to see a doctor for illnesses or injuries needing urgent care, White-Wilson Immediate Care clinics are open seven days a week in Fort Walton Beach. Click here for Immediate Care hours and locations. Anything that falls outside of a general internist's diagnostic scope will result in a referral to a specialist for further treatment. As is the case with other general practitioners, the internist would continue to play a significant role in the patient's continuum of care. Vergil Brown III, M.D, Ph.D.